When the American iconic Stax Records label kicked off in 1957 (under the name Satellite Records) it served as our first major profitable "Garage Band Company" until its headquarters moved from a garage to the former South Memphis, Tennessee Capitol Movie Theatre where its location and output shifted from Country Western releases to R&B. More than fifty years after its creation and throughout many incarnations, records, and artists, it seems only fitting that the label that changed its image based on its movie theatre location is releasing the soundtrack for a movie which derived its name from "the most successful Stax single to date upon its release," namely the Isaac Hayes and David Porter co-authored hit "Soul Man." 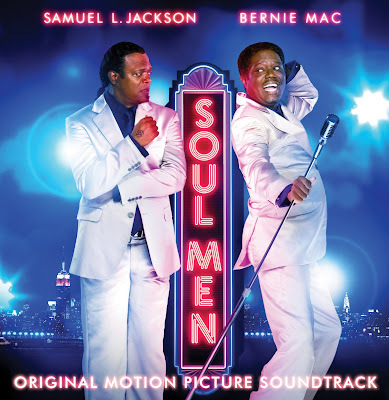 In Soul Men, director Malcolm D. Lee uses the backdrop of the heyday of R&B and soul music for his fictitious tale of two band members (played by Samuel L. Jackson and Bernie Mac) who grudgingly reunite after a twenty-year silence to play New York's Apollo Theater upon learning that their third band-mate (played by John Legend) has passed away. Although it makes for comedic fodder in the film, the soundtrack pays tribute to the legends and music of Stax with inventive neo-soul remakes and also with the inclusion of classic tracks by artists like the legendary Isaac Hayes. Hayes not only appears in the movie but unfortunately, along with the film's star, Bernie Mac passed away in unrelated circumstances only one day apart in August of 2008. While in light of their tragic and untimely deaths, this makes for an especially emotional experience listening to Hayes sing "Never Can Say Goodbye" which is included as the fifth track on this terrific soundtrack. However, the rest of the album is definitely worth a look and contains some great comical riffs by Mac, thus honoring both men with the Stax release. Kicking off the classic "Soul Music" by neo-soul artist Anthony Hamilton, it sounds incredibly fitting when he sings the phrase "nothing like sweet soul music to bring us together." And the album moves from the up-tempo hit to a beautiful cover of "I'm Your Puppet," featuring the film's fictitious band "The Real Deal" (comprised of Mac, Jackson and Legend) in which John Legend's smooth, honey-tinged voice helps add polish to the actors' untrained stylings which is apparent not only in the chorus but when Legend sings his solo lines. Chris Pierce and Leela James tackle William Bell and Judy Clay's '68 British chart-topper "Private Number" which you can stream below. Me'shell NdegeOcello contributes a laid-back and bluesy interpretation of "Water" and later Jackson and Mac return for their second of three great tracks with a rousing rendition of "Boogie Ain't Nuttin' (But Gettin' Down)" and the album closer "Do Your Thing," along with actress Sharon Leal that evolves into a nearly fourteen minute riff heavy, improvisational styled track where Mac cracks up listeners as the tape continues to roll. While Ryan Shaw's funky, retro-inspired toe-tapper "Memphis Train" is one of the definite highlights and Leal sends shivers with her gorgeous "Comfort Me" both of which fit right in with some of the album's classics, I was especially taken in by Sharon Jones & The Dap Kings's wildly clever cover of the Kenny Rogers Big Lebowski anthem "Just Dropped In (To See What Condition My Condition Was In)." A great stand-alone album that celebrates the soul music of the 60's and 70's and manages to pay tribute to the deaths of two Soul Men as well, the soundtrack to helmer Malcolm D. Lee's new film is definitely a keeper for fans who "Never Can Say Goodbye."